Birds... living on the wind! Why do birds consistently follow certain routes in their migrations? Pathways of migration evolved, shaped by the wind. During the height of the last ice age, ice-free breeding habitat for songbirds remained in what is now Alaska and parts of Western Canada. Studies of fossil pollen show that consistent winds blew across the continent on a NW:SE heading of 155 degrees. Scott Weidensaul recounts in his book Living on the Wind: “A powerful high-pressure center over central Canada pumped strong northwest winds, precisely the conditions that would aid migrants.” The birds rode these tailwinds to traverse the ice fields. 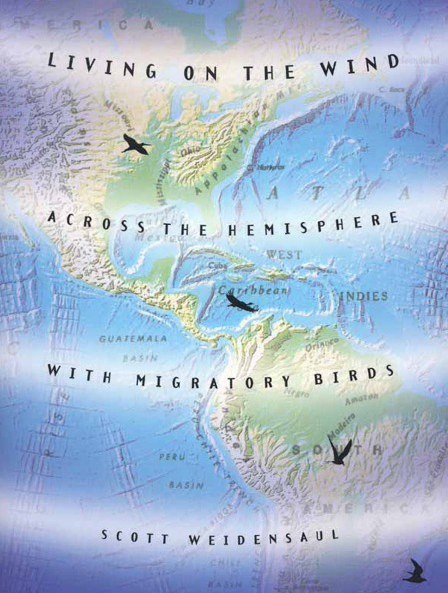 And today, the birds still follow this bearing on their migration to South and Central America and the Caribbean. Today’s show brought to you by the Bobolink Foundation. Find us on the web at birdnote.org. Song of Blackpoll Warbler  provided by The Macaulay Library of Natural Sounds at the Cornell Lab of Ornithology, Ithaca, New York, recorded by M. Medler. Songbird ambient breeding season in AK recorded by G. Vyn (ambient on Yellow-billed Loon track). Learn more about Scott's book, "Living on the Wind"